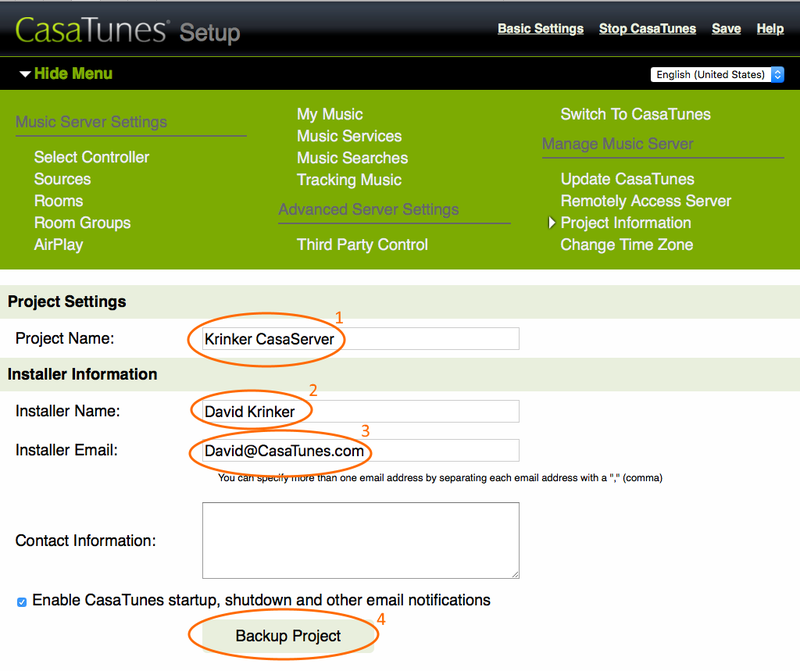 We recommend you backup your CasaTunes configuration once you have finished configuring your system. You can use this backup to recover your music server settings in the event you inadvertently change the configuration at a later date, or in the unlikely event, you need to replace your music server or music server hard disc. 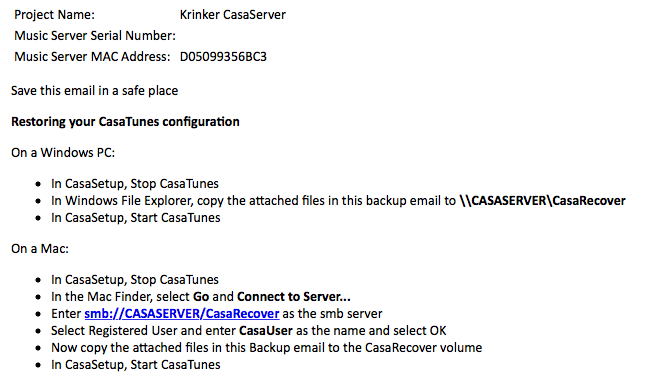 When you manually backup your music server using CasaSetup, CasaTunes sends you an e-mail, with all the critical settings attached, along with the instructions on how to perform a restore. In addition to manual backups, CasaTunes will automatically backup your configuration to the cloud, prior to performing a CasaTunes update and also when you change your hardware configuration. However, we still recommend you perform your own manual backup because CasaTunes has no way of knowing which is the correct backup to use, if you need to perform a restore. In addition, access to cloud based backups is only available to CasaTunes Technical Support, and if you do not create your own backup, you will need to contact them to perform the restore. In Step 3 below - Enter your email address(es). This email will be used to send your backup information and restore instructions, as well as all CasaTunes notifications, if you check the Enable CasaTunes startup, shutdown and other email notifications option. Once you receive the email, store it where you can easily retrieve it, if you should ever need it. Also, don't forget to perform an additional backup every time you reconfigure the music server.